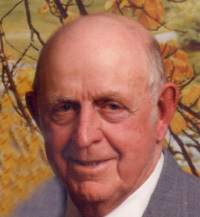 Wilbur G. Bugger, 85, of Trenton died Friday June 25 at St. Mary Hospital in Richmond Heights Missouri. He was born August 13, 1918 in Blackjack, Illinois to John and Lillian (Schildknecht) Bugger. They preceded him in death. He was a farmer and a member of St. Mary Church and men’s sodality in Trenton, The National Farmer Organization. He married Evelyn Mueller February 22 1944 at St. Mary Church Trenton and she survives in Trenton. He is also survived by a son Bob Bugger of Belleville and daughters Betty Pish of Highland, Rita (Rick) Renner of Lebanon and Janet Haas of Belleville. He has 7 grandchildren and 3 great grandchildren. He was preceded in death by two sisters, Henrietta Demond and Irene Haukap. Funeral services will be held Wednesday June 30 10:30 Am at St. Mary Church in Trenton with Fr. James Daugherty officiating. Interment will be in Calvary Cemetery Belleville. Friends may call at the Moss Funeral home in Trenton Tuesday June 29 from 4 to 9 Pm and Wednesday June 30 form 8 to 10:15 AM. Memorials can be made to St. Mary church and will be received at the funeral home.